A Merry Christmas from The Doctor Who Site, We hope you received everything you wished for this year. Hope everyone had a Merry Christmas and a happy new year. And to Luke and yourself. Hope everyone had a good Christmas and roll on New Year’s Day! Hope you all had an amazing Christmas!!! Hope you all had a happy Christmas. Watched shada to fill the who gap. I watched Inferno and last years Xmas special. Gotta have something till the Daleks on New years Day. What was your verdict on series 11 gordon? That’s a coincidence I’ve just finished reading the novel again on Christmas day. New year’s day is my traditional watch of an old who. Done it for over 20 years now, a doctor who story in the afternoon as the first watch of a new year. Last year was empress of Mars, this year I’m thinking of the time warrior followed of course by the newest who later that night! Have to say overall I’ve enjoyed the new series. Didn’t even mind the tsuranga conundrum. Agree with Gordon that woman, rosa ect were better than it, but I didn’t mind it. Really enjoyed demons as it was history I was unaware of. Merry Christmas! Hope you have a wonderful time and thank you so much for everything you do on this amazing site! Happy Christmas everybody. 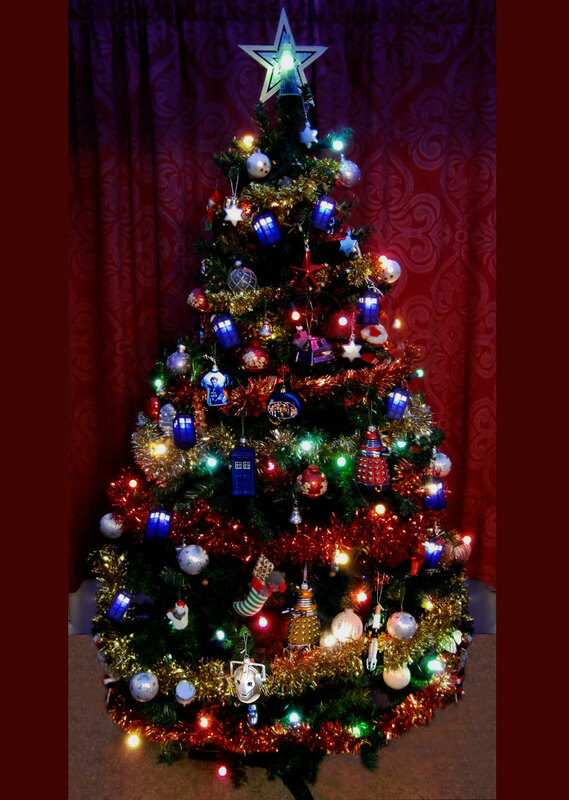 I’m loving the Christmas tree photo, its even got a weeping angel on the top. Merry Christmas drwhosite, and a big thank you from me for such a fantastic site…fabulous work. love, hugs and the very best of wishes from me, to everyone. I wish you all a Dark Christmas Ha Ha Haaaa! Merry Christmas to you and Luke, enjoy today. Merry Christmas everyone! Special thanks to boo boo and Luke. And here’s looking forward to the new year special… they’re back! Merry Christmas to everyone and did you happen to hear a VERY familiar voice in the slightly updated trailer for Resolution? It was shown after the Wallace & Gromit film. Thanks for all your hard work throughout the year, hope you get lots of great WHO merch for Crimbo and here’s to much more great stuff in 2019. And incidentally, a Merry Christmas to all of you at home! Merry Xmas and a happy New Year To you all. I think there will be some good stuff to collect in 2019, to make up for a mostly ‘WHO’ gap year. Roll on the RH Mutant and Drathro figurines for starters. Good Times ahead. Merry Christmas Booboo and Luke. Here’s to another great year of TheDoctorWhoSite! Quite frankly the best and friendliest Doctor Who site in the Galaxy. Merry Christmas! Have a great day! Hope you get all the Doctor Who merch you wanted!